Keeping up with the habit of reviewing the year gone by, here's how my 2018 went. I started off 2018 with a few intentions. I didn't want to label them as resolutions or goals as they sound too restrictive. As always, I wanted to try a few things which I've never done before. 2018 was the year when I ran my first 5K and 10K runs - 5K millet awareness run in Jan and 10K Pinkathon run in Feb. I didn't do any special trainings for the marathon as the regular yoga practice kept me more agile. My Yoga teacher taught me to concentrate on my breathing during the run and also a few stretches to do before and after the run. These helped tremendously and I completed both the runs without much tiredness or exhaustion and was able to recover quickly. Though I enjoyed the runs, I'm not planning to register for them anymore. Yes, it gives a sense of accomplishment but looking at the tangible (registration fees, petrol expenses to drive to and from the far-off marathon locations) and intangible costs (the daunting amount of plastic waste each marathon generates), I don't think they are worth it. If I want to set and achieve running goals, I might as well run around the lake nearby my apartment. In 2017, I started to write detailed posts on ingredients of various packaged foods. Many readers appreciated the efforts and some of them even messaged me saying that they have stopped buying such packaged foods after reading my posts. I continued with reviewing more packaged foods in 2018 and analyzed over 25+ products in my blog. 2018 also brought me a few opportunities to speak to parents/communities on what goes in packaged foods. I enjoyed preparing and delivering the talks as they combine my two favorite interest areas - public speaking and nutrition. The most memorable talk was the one I gave at Bhoomi College to students pursuing a programme on sustainable living. The no-junk-food birthday party continued this year and though it was a FLOP, I'm glad I stuck to my beliefs. I continued the same practice for Halloween celebrations as well. For most festivals this year, I prepared traditional sweets and savories. I want my daughter to be aware of various Indian festivals and I plan to continue celebrating all festivals with the same traditions that my grandmothers used to follow. This year, husband and I went for a couple of workshops together - First, a water colour painting workshop. We both had fun teasing each other on how our painting skills are so pathetic 😉 Then we went for a minimalism workshop, a topic that is of interest to both of us. This workshop introduced me to Durgesh Nandini, who practices minimalism and zero waste among various other things. I find her ideas very inspirational and easy to connect to. Call it serendipity, I bumped into her again in the zero waste meetup in Chennai. I visited her minimalistic home and we chatted for 2 hours on various topics. I returned home with a lot of inspirations and ideas to work in 2019. I rarely take part in any activity being organized in my apartment. Though I want to, the timings are just not working out. This year, I participated in a poetry reading session and it was truly enjoyable. I read a few poems of mine and it was so interesting to hear poetry written by others. After repeated failed attempts to get my voter registration done, I FINALLY managed to get my voter ID card this year and I voted for the first time in Karnataka assembly elections. This milestone needs to be tracked in my review. On the professional front, I took up a consulting assignment to identify and define a minimum viable product for a particular area in the education space. It gave me good exposure to understand the current challenges students face in showcasing their capabilities and becoming job-ready. This year, D moved to 1st grade, which means an early school start time and 3 boxes (breakfast, snack, lunch) to be packed by 6:45AM. This has been a big challenge for me, since I'm a slow starter in the mornings. So my weekdays begin at 5-5:15AM and I finish cooking breakfast and lunch by 7AM, send her off to school by 7:15 and head straight to Yoga class. After Yoga, my work begins immediately after a quick breakfast. Since the weekday mornings have become so rushed, I decided to take it easy on weekends and I stopped my weekend breakfast catering work that I used to offer to my apartment neighbours. Though I had set a goal of reading 50 books this year, I managed to finish only 16 and a few are in progress. We did 3 long weekend trips this year - Coimbatore, Ooty and Pondicherry. And frequent visits to Chennai. Other than these, we couldn't do much of traveling. Tried out 20+ new recipes, didn't track the count accurately. I guess it is not needed either, as long as I have the spark to try out new recipes. So that's my long review of 2018. Let me share my intentions for 2019 - being mindful of my time and energy, minimize things at home and consciously reduce waste, invest more time doing deep work and consciously improve my focus and attention. Other focus areas like eating healthy, Yoga, staying active, no compromise on sleep will continue in 2019. Wishing you all a very happy, healthy and peaceful New Year 2019!! The title of this book leads one to believe that it attempts to show how different the 2 epics are from one another. As one reads the book however, it becomes clear that the intention of the book is two fold. It brings out the similarities as well as the differences. This is also evident from how the book is structured, its grouped into 8 sections with multiple chapters and the title of each chapter begins with "Both". For example, "Both are family disputes over property". If you have the faintest recollection of the 2 epics, you might be able to guess what this is referring to. In the Ramayana, Bharat's mother Kaikeyi convinces Dasharatha to make Rama go into exile, which he accepts willingly. In the Mahabharata, the Kauravas trick the Pandavas to do the same through an act of gambling. The author show other parts of the epics that relate to the same theme. For example, in the Ramayana, the family dispute also occurs between Vali & Sugriva, who are brothers. Vali overpowers Sugriva by might and banishes him from the kingdom. Ravana also does the same with his half-brother, Kubera before establishing his rule over Lanka. The latter is usually not covered in many renditions of the epic, and thus the book also educates the reader on less known facts. There are references into local folk retellings of both the epics. For example, in the chapter "Both have secret stories of vengeance", the author draws out a retelling that shows how Surpanakha (Ravaana's sister) is the mastermind and seeks out Rama with the intention of causing Ravana's downfall. In the case of the Mahabharata, there is another retelling that shows how Bhishma kill Shakuni's father & brothers, and that's the reason why Shakuni ensures the Pandavas & Kauravas never became friends. These retellings lend a darker theme to both these epics and educate the reader about how the world is clearly divided into black or white, hero vs villain. The most popular renditions of the Mahabharata show Bhishma to be a noble warrior. These retellings bring out his character flaws. There are also references to Greek mythologies & other religions like Judaism, Buddhism & Christianity to draw out both similarities & differences. This gives the reader a wider perspective & also brings in credibility into the author's vast knowledge of the subject at hand. Its important to note that this book is more like a summary and does not elaborate the details in a story like mode. Hence, this caters more to the advanced reader. By no means is this book an introduction to the two great epics. If one is new to either one, the reader would be lost in a sea of facts, and not find much interest in reading through this book. This book is a treat for all those have read multiple versions of the Ramayana & Mahabharata, including the author's own versions (Sita & Jaya). Since both these epics are usually read independently, this book is unique and gives insight into how they are related and intertwined. A few days back, there was a contest hosted in Instagram where many food bloggers were creating "innovative" and "healthy" recipes using Parle biscuits - halwa, burfi, laddoos etc. Why would we want to mess with traditional recipes, I wondered. Most of the biscuits shown in the contest photos were from the newly launched Nutricrunch brand. The company’s new brand is focused more on consumers who consciously opt for healthy offerings, rather than those who choose health once in a while because of price-based promotions. 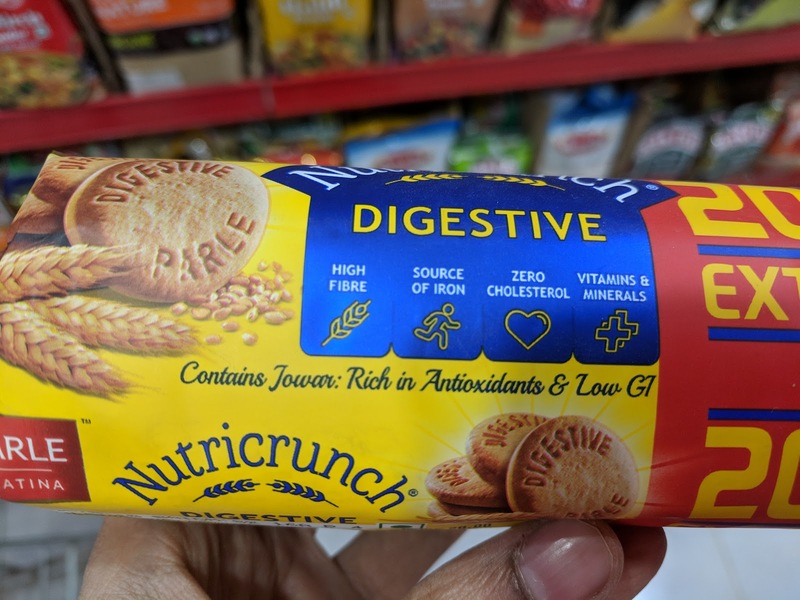 Nutricrunch’s range will include products such as digestive cookies, low-sugar cream crackers, digestive Marie biscuits, etc. Some variants will include indigenous ingredients such as jowar. The range will also include products that target lifestyle issues such as weight management, sugar and cholesterol management and nutrient deficiency. 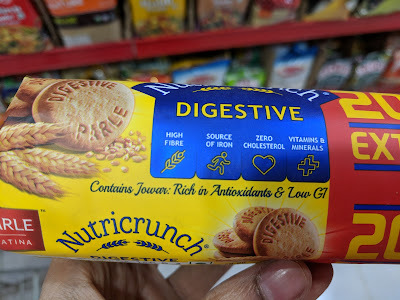 It is clear that the brand wants to be positioned under "health biscuits & cookies" segment. As a conscious consumer, it is our responsibility to examine and evaluate if the brand's offerings are true to this positioning. 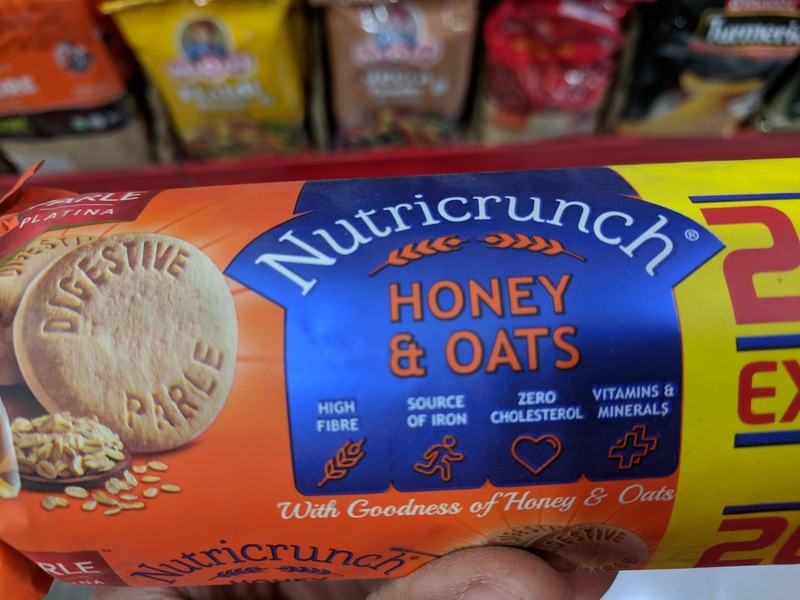 Let's talk about 2 products under the Nutricrunch brand in this post. I had earlier analyzed two popular digestive biscuits - McVities and Brittania Nutrichoice Digestive Zero. If you haven't read my analysis, please do check them out. Now how do we validate these claims? Simply turn to the back of the pack and check the ingredients list and nutrition facts table. 2.100 gm of these biscuits contain 14.8 gm OR nearly 4 tsp of sugar AND 20 gm OR 5 tsp of unhealthy fats. Though the sugar levels are low compared to Parle-G, the unhealthy fats are quite high. 3.Does the brand really contain high fibre as it claims? Not really. 100 gm of these biscuits contain ONLY 6 gm of dietary fibre. 4.There are also other unwanted ingredients in the form of raising agents, invert syrup, emulsifier, artificial flavours etc. As I keep reiterating, digestive biscuits are as unhealthy as a regular Marie biscuit. Why pay a premium to buy the same maida, palm oil and sugar combo? Let's see how much "goodness of honey and oats" is actually present in this pack. 1.Do you see the similarity between the two ingredients lists? Were you able to spot oats and honey in this list? What goodness would you get with such a low percentage - oats 3.8% and honey 1%? The predominant ingredient is indeed maida (37.8%). 2.The sweetness is NOT from honey as you might have thought, but from sugar and invert sugar syrup. 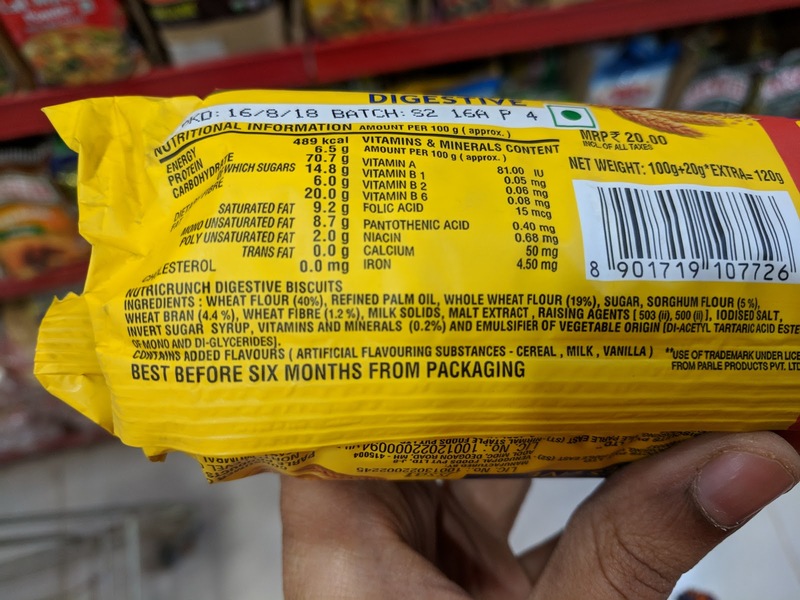 100 gm of these biscuits contains 18.7gm of sugar (close to 5 tsp of sugar). And let's not forget the unhealthy fats from refined palm oil - 19.2 gm of total fats per 100 gms of biscuits. 3.One might have also thought that this brand might contain high fibre because of oats. 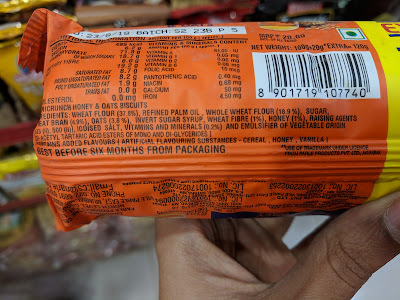 No, it contains only 6gm of dietary fibre per 100 gms. Biscuits are never healthy, irrespective of their name or positioning. Let's stop this habit of having biscuits with tea/coffee. If you are concerned about your health, stop searching for new products in the supermarket. Get into the habit of cooking at home. Eat wholesome meals, you wouldn't need such unhealthy fillers/snacks to munch on in the first place. Come Oct every year, we keep hearing about the smog in Delhi. The reasons quoted in the media were mostly focused on stubble burning and/or Diwali crackers. I wanted to understand the underlying reasons behind stubble burning and the other reasons behind rising air pollution, not just in Delhi but also in other parts of the country. This year, both my husband and I were hit with allergy related cold and cough often. The frequency of such issues were higher, compared to the previous years. And the recovery took more time than the usual viral infections. Dust, mites, traffic, smoke etc were the reasons given for these allergies. Similar to the way I tried to understand about food and nutrition over the past 5-6 years, I have been wanting to understand in depth about what goes in the air we breathe and water we drink. This book "The Great Smog of India" couldn't have come at a better time. The author has taken ample effort in demystifying air pollution and the various facets that need to be considered. Starting from the basics of what constitutes air pollution, particulate matter and its various sources, the first 3 chapters set the context very well, before diving into the reasons and sources that increase particulate matter in the air. The author also raises valid concerns on the silence towards air pollution related issues and its impact on health care, employment and productivity of citizens, which would in turn impact the growing economy. I was simply nodding my head when he talks about how India's economically privileged class have managed to escape situations where the Govt has offered sub-optimal solutions in fields of education (private schools), health care (private hospitals), security (gated communities), clean water (water purifiers and filters) and now clean air (air purifiers). Not only do air purifiers allow us to consume clean air, they also lead to increased energy consumption - which in turn can lead to increased power demand and therefore emissions, further impacting those who cannot afford the purifiers. After setting the context, the author has taken the reader on a journey by explaining the 5 main reasons behind the "great smog" in a clear and easy to understand language without any complicated jargon. The chapters explaining the history and timeline of various critical decisions behind these 5 reasons were quite insightful. I was particularly interested in reading about rice-wheat cropping system being followed by farmers in the Northern region which necessitates burning crop residue, because of the limitations and costs involved in other alternative solutions. The book also talks about various solutions to address this problem of air pollution - "reduce or remove the sources of pollutants using innovative policies, technologies and investments". Air pollution needs to be considered an important "national" issue to be addressed. Instead of blaming the meteorological reasons, inaction by certain states, lack of cohesive policies and lack of right data points to quantify the issue, we need to look for innovative solutions, addressing the various sources of pollutants. It was truly an insightful read with many key take-aways. If we care about the air we breathe in, we need to know how it is getting affected by various factors. It is high time that we as citizens take serious note of this issue and demand the right solutions from our elected representatives. You might have heard of the familiar 5Rs related to waste management and sustainability - Reflect, Refuse, Reduce, Reuse and Recycle. Over the past few weeks, I have been thinking of a similar framework that is so relevant to healthy eating habits as well. Having been reading about food and nutrition for many years now, I have come to believe that both from a quality and a quantity standpoint, our eating habits have become poor. Because of the poor quality ingredients being used in processed foods, the frequent eating-outs, take-aways, the pesticides and chemical fertilizers being used in our fresh produce, the quality of foods we put in our mouths have deteriorated over time. The other important but overlooked aspect is the Quantity. It is shocking to note how we keep munching something or the other throughout the day, mindlessly in front of our screens. There is hardly any gap between meal times. More than the main meals, we tend to snack a LOT. These may not be applicable to the entire population but a general trend among the affluent. We keep adding more and more super foods and other ingredients to our daily diet, in the hope that green tea will reduce belly fat, quinoa will help in weight loss etc. Our pantries and fridges are filled with so many stuff (jams, preserves, sauces, spreads etc). If an ingredient is promoted as a super food, we immediately add it to our never-ending shopping list. Instead of "adding" more to our diet, I would suggest we "Remove" or "Reject" certain foods and ingredients. Remove/Reject anything packaged, especially those with a lot of unidentifiable ingredients. Remove all that is imported and has high carbon footprint. When it comes to healthy eating, "less is more" is so true. We don't need fancy ingredients. We can lead a healthy life with a minimal pantry. Replace is something that we have all been addressing over the past 5-6 years. So I'm not going to dive into the details, as the awareness is high. Replace unhealthy ingredients with healthy, natural ingredients. The main intention of this post is to talk about the second R - Reduce. Reduce the quantity we eat, as we age. I read somewhere that as we enter our 40s, the number of meals should be 2 and not 3. If that's not feasible, let's atleast try to reduce the quantity we eat in each of our 3 meals. Reduce mindless snacking - when your mind is occupied with a tough problem or you are ruminating about some issue at workplace, no unnecessary munching please. When you are relaxing in front of a TV, no snacking, especially late nights. Reduce the frequency of restaurant trips, take-aways and home deliveries. Reduce the amount of groceries you buy on a weekly/monthly basis. I had shared a few tips in this post. Reduce the number of food options when you are hosting a party. Let the focus of the party be about interesting conversations and NOT ONLY about food. Reduce the number of items you cook on a daily basis. It is better to eat 1-2 freshly made dishes than 4-5 dishes that have been cooked a week back. I don't remember my grandparents eating a feast every other day. They ate simple fresh meals and led healthy lives. Reduce the number of treats - sweet and deep fried. Brands pitch their chocolates with the tagline "sweet edu, kondaadu" for every teeny tiny event. If you want to treat yourself after achieving a tiny milestone, why not an experience you would enjoy that doesn't involve food? For me, that would be half-an-hour of uninterrupted time to listen to ARR's music, an afternoon nap on a Saturday or relaxed time to cuddle up with a good book. Food gives us energy, nourishes us and helps us to pursue our life's goals. That doesn't mean we pressure our digestive systems to be constantly working all through our waking hours. The reason why intermittent fasting works for many people is the break our digestive system gets from processing all the food we stuff into our mouths. I hope that this 3R framework makes sense and helps you to look at healthy eating in a different light. Comments welcome. P.S. This post is equally applicable to me and my family as much as to my readers. I'll revisit this post whenever I'm deviating from these 3Rs. It is certainly not my intention to advise if it comes across so, but merely sharing my thoughts on this topic.